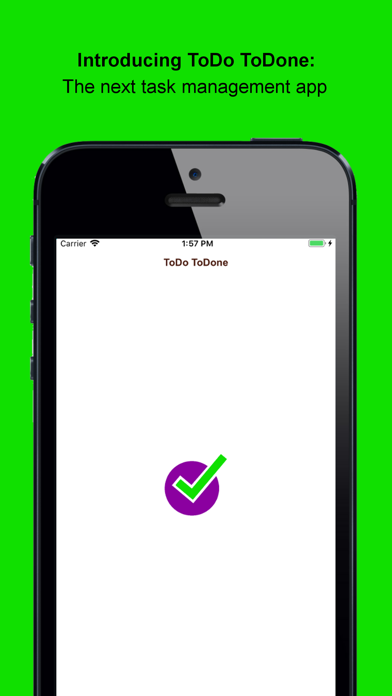 Introducing the next task management app: ToDo ToDone! 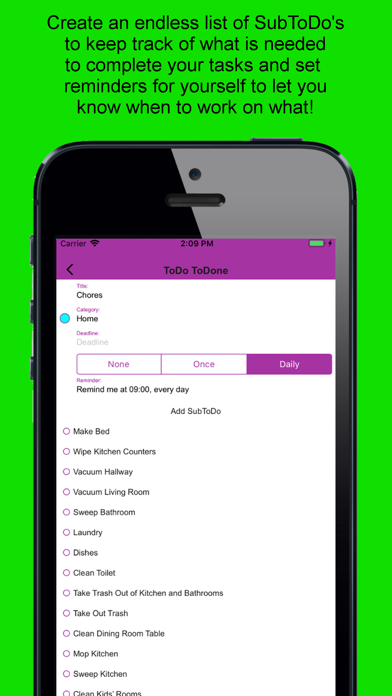 Keep your life organized and turn your ToDo's into ToDone's! - Categories: Keep it organized with categories. Assign a custom color and as many ToDo's as you want to to each category! - ToDo List: See your ToDo list as soon as you open up the app. See just how close you are to completing your ToDo's with a percentage or a completion bar! - SubToDo List: See what you still need to complete by tapping on a ToDo to see your SubToDo list or quickly mark off tasks by using 3D Touch on a specific ToDo to see a list of that ToDo's SubToDo's! - Reminders: Set your own reminders for each ToDo and always remember when a ToDo needs completed. You can even quickly access that ToDo right from the notification!